This is the door handle used by Gropius in his 1925 design for the Bauhaus building in Dessau, Germany. TECNOLINE is the only company, authorized by the Gropius heirs, to produce the original handle. Gro D 22/125 E... Pair of levers, complete with lever roses and spindle. An exceptional example of a German decorative art object which combines the functionality of the Bauhaus style with d�cor. The grip of the handle consists of a hexagonal profile. All the retaining screws are covered with shields. Pair of levers, complete wirth round lever roses (with screwed on covers and concealed fixings) and spindle. ... Ni Polished and nickel plated. ... Ni Matt Matt brushed nickel plated. ... M Brass polished and clear lacquered. ...Chr Polished and chrome plated. The famous architect, Ferdinand Kramer designed this simple but elegant, conical shaped door handle in 1925. TECNOLINE is the only company, authorized by Kramer heirs, to produce the original Kramer handle. FKD 25 Rd... Pair of levers, complete with round lever roses and spindle. ... Chr Polished and chrome plated. FKD 25 U... Pair of levers, complete with spindle and roses with concealed screws. 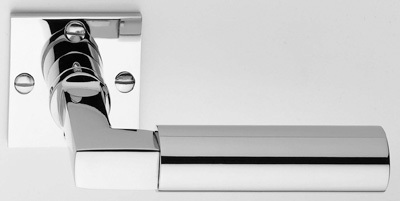 The shape of this handle highlights the cubist influence of the Art-Deco period. The light and elegant effect of the handle is obtained by the shifted segments. KU D 30 E... Pair of levers, complete with square lever roses and spindle. KU D 30 Rd U... Pair of levers, complete with spindle and roses with concealed screws. Wagenfeld designed these handles for the now defunct firm of S.A. Loevy Co. in Berlin. They were produced and sold in limited quantities, for example for the doors of the former Columbus House. These handles have not been manufactured since the thirties. The handles and keyplates are made of cast brass. We had Professor Wagenfelds prototype on which to base our reproduction. WD 28 Rd... Pair of levers, complete with round lever roses and spindle. Between 1926 and 1928, Ludwig Wittgenstein, philosopher and architect, designed and built his home in Vienna. He also designed the complete interior including the doors and windows and all associated fittings. For his doors he developed a special handle using a round metal rod which we have taken and reworked to bring it up to today�s standards of technology. Attention: Pair of levers consists of one straight and one curved lever.